Urban Food Maven: Menu For Hope and The World Food Programme - Only A Few Days Left! Menu For Hope and The World Food Programme - Only A Few Days Left! 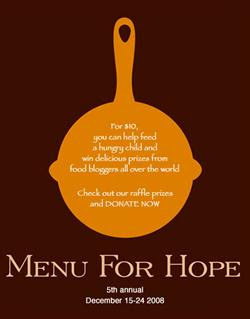 Menu For Hope is an annual fundraising campaign, spearheaded by Chez Pim and many foodbloggers from around the world. This effort originally started five years ago after the devastating tsunami in Southeast Asia by which Chez Pim was inspired to start the first Menu For Hope. Since then it has become a yearly campaign to raise funds for worthy causes around the world. Each December, food bloggers from all over the world join the campaign by offering a delectable array of food-related prizes for the Menu for Hope raffle. Anyone can buy raffle tickets to bid on these prizes and for every $10 donated, you earn one virtual raffle ticket to bid on a prize of your choice. And believe me, the prizes are truly amazing! At the end of the two-week campaign this Wednesday, Christmas Eve, the raffle tickets are drawn and the results announced on Chez Pim. For any FAQ's such as how to donate, how are the donations collected & distributed and more on the beneficiary - the UN World Food Programme - please click here. Last year, Menu For Hope raised nearly $100K to help the UN World Food Program (WFP) feed the hungry. And this year, for just $10 or more, you too can help keep kids in school and win delicious food prizes from food bloggers all over the world. Unfortunately, I got a late start, because I just now got wind of this. The campaign started on December 15th and runs through this Wednesday, Christmas Eve, which means there are only a few days left! So please, if you would like to donate to the cause, go online now and browse the amazing array of prizes by type, or find a prize near you by searching by region. Bid on as many prizes as you'd like. Buy raffle tickets as holiday gifts to your loved ones. Here is that link again. This holiday, help us help the WFP end world hunger.